IT MAY only be February but south London snooker star Ronnie Sullivan already has one hand on the Cuestars South of England Under-21 Bronze Tour title. And he has set one record and is eyeing another. 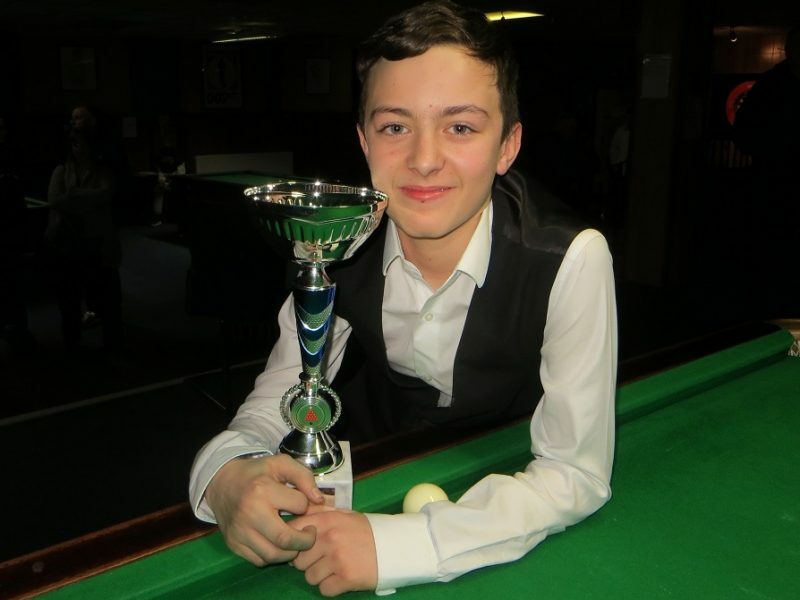 The 13-year-old from Chipstead celebrated with a generous slice of chocolate Swiss roll after collecting his fourth winner’s trophy of the season at the sixth leg at Top Spot Snooker Club, Havant. Sullivan, who has appeared in eight consecutive finals since near the end of last season, defeated Riccardo Drayton (Chandler’s Ford) 2-0 to claim maximum rankings points. “I played out of my skin in the final,” he said. Sullivan is set to become the first player in the nine-year history of the competition to jump straight from Bronze to Gold. He passed the Gold threshold of a 60 break with a 61 in a handicapped tournament at his home club, Frames Sports Bar, Coulsdon. Cuestars organisers reckon Sullivan “already looks like a Gold player”. And he now wants to become the first to appear in every final over a season. Sullivan added he is “looking forward” to next week’s trip to Leeds for the last-16 of the English Under-14 Championship. Meanwhile, Mason Wilson (Baughurst, near Basingstoke) made the semi-finals for the first time. He won three of his four group-stage matches and overcame newcomer Thomas Sharp (Portsmouth) 2-0 in the last-eight before losing 2-0 to Sullivan. In the second semi, Drayton beat his nine-year-old cousin O’Shay Scott 2-1 from 1-0 down. Sullivan takes a 36-point lead over Samuel Laxton (Portsmouth) into the remaining four tournaments. Drayton is ten points further adrift in third. Remarkably, the top three had been drawn together in the same four-man round-robin group – along with Louie Leighton (Basildon), who was runner-up in Bournemouth last month. Laxton won all of his matches but went out 2-0 to Scott in the quarter-finals. Drayton qualified as one of the two best thirds via a six-reds play-off against Owen Jenkins (Havant). Fareham Snooker Club hosts the seventh leg of ten on Sunday, February 25. Trophies were presented by event sponsor Trevor Sanders from Trevor Sanders Snooker and Pool Table Services, a Fareham-based family-run firm that can be contacted via www.snookerandpooltableservices.co.uk/ . ROUND-ROBIN GROUP A: 1st, Oliver Cooper (Frames, Coulsdon); 2nd, Mason Wilson (Academy, Basingstoke); 3rd, O’Shay Scott (Chandlers Ford SC); 4th, Dean Russell (Waterlooville Sports Bar); 5th, Zak Truscott (Waterlooville Sports Bar). ROUND-ROBIN GROUP B: 1st, Samuel Laxton (Waterlooville Sports Bar); 2nd, Ronnie Sullivan (Frames, Coulsdon); 3rd, Riccardo Drayton (Chandlers Ford SC); 4th, Louie Leighton (Rileys, Benfleet). ROUND-ROBIN GROUP C: 1st, Will Forster (Mayfair, Gosport); 2nd, Thomas Sharp (Waterlooville Sports Bar); 3rd, Owen Jenkins (Waterlooville Sports Bar); 4th, Vinnie Rix (Waterlooville Sports Bar). QUARTER-FINALS (12 points): Drayton 2-0 Cooper, Scott 2-0 Laxton, Sullivan 2-0 Forster, Wilson 2-0 Sharp. SEMI-FINALS (15 points): Drayton 2-1 Scott, Sullivan 2-0 Mason. FINAL (25/18 points): Sullivan 2-0 Drayton.